Here are a couple we've been able to pick up in our travels... one at the top is a cheap internal car brake light. 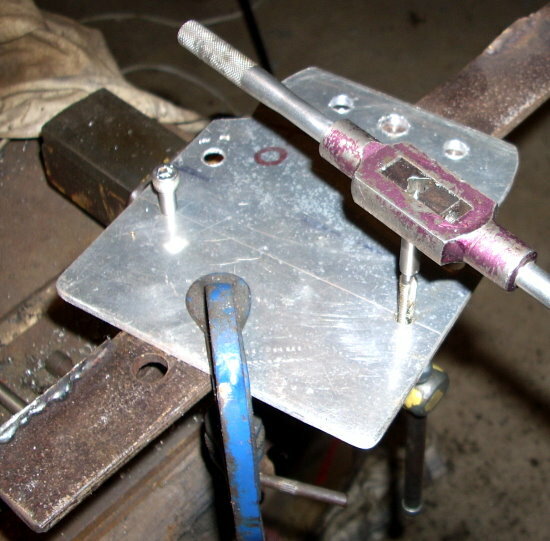 The globe holder needs modification to allow a two pin globe for brake and tail. But it's too large for this slim little chopper. Light on the right is another cheapie... for a trail bike... bit too small and it needs work to get rid of the rubber, but still keep it looking good and staying water proof. Side mounitng is also a possibility. It is not legal, not very safe unless a clearance light is put on the other side and too bulky for our slim chopper. Having had a side mounted taillight and number plate, I also don't recommend this set up because it is always catching on things!! 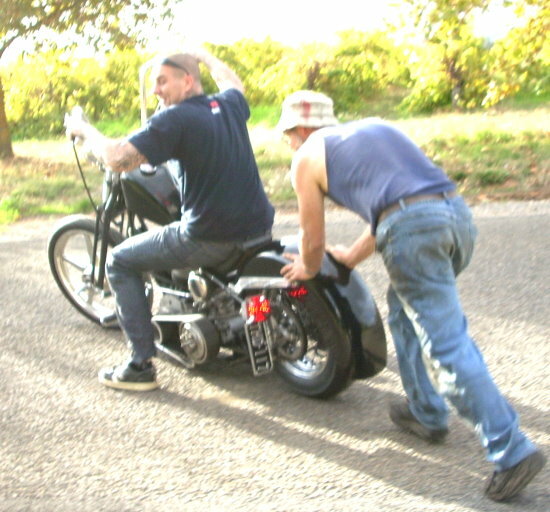 This one by the way is on Luke's Shovel chopper, which we got going a few weeks ago. Carby troubles were the cause of this method of starting... but finally got it going first kick each time. With my legs like they are my contribution was rather short lived! 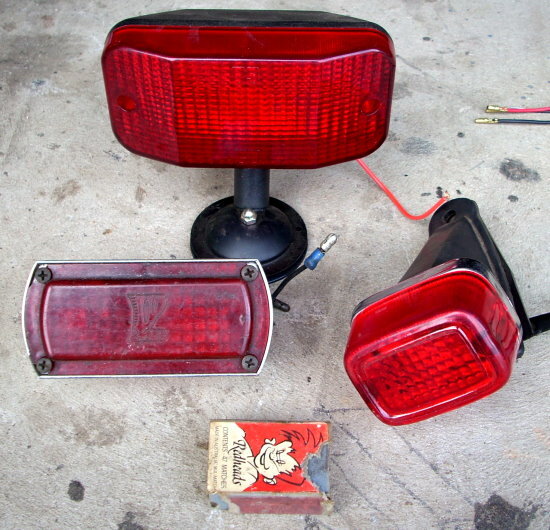 We are going to go with the old box style tail light and mount it and the number plate on the sissy bar. This was the most common sixties/seventies system: strong, simple and quick to do. 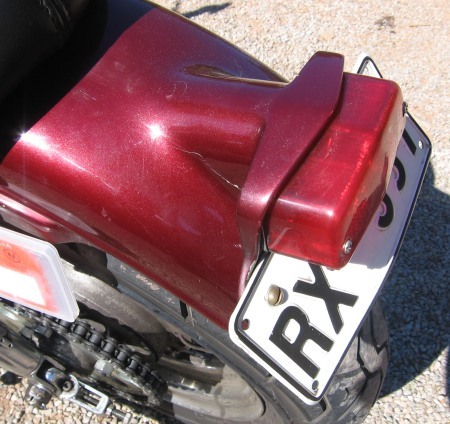 An easy way to mount taillight and number plate is as a unit. Start with a piece of 4mm aluminium plate. We could get away with 3mm on this smooth little Japper, but not a Harley with its coarser vibration. In this case I want to do away with nuts on my number plate mounting, so the 4mm plate it is. Here the plate has been cut out on the band saw (Hacksaw will do fine though). It has been cut around the light and is wide enough to support the number plate and fit our mounting holes on the sissy bar. Always work froom a centre mark. A verniers, divider or piece of paper are the most accurate ways of measuring for holes. measure to centres. When drilling holes, centre drill first. The centre bits are expensive but essential for accuracy. You can get away with a 1/8" poprivet bit which has a long shank ans short amount of fluting. 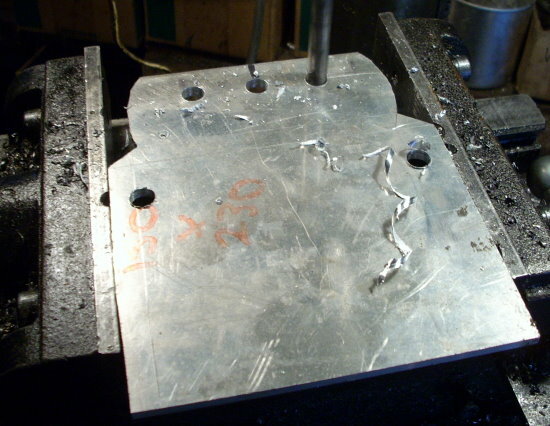 To prevent bending when gripping thin plate in a vice, support it underneath with a piece of flat woood. This 4mm plate doesn't need support, but keep it in mind for future jobs. Bolts holding number plate will screw into the threaded plate. We have used ¼"UNF. It is usual to use coarse threads in aluminium, but because this is thin plate, we need all the threads we can get... we just need to be careful when tightening the bolts (Stainless socket heads). 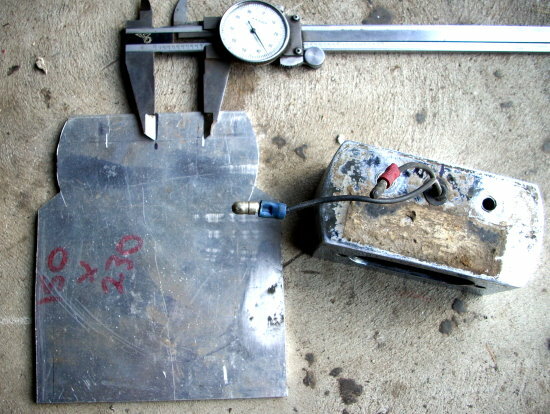 To hold this plate for threading, a piece of angle is clamped into the vice and then the plate is 'G' clamped to the angle iron. Contsruction finished. 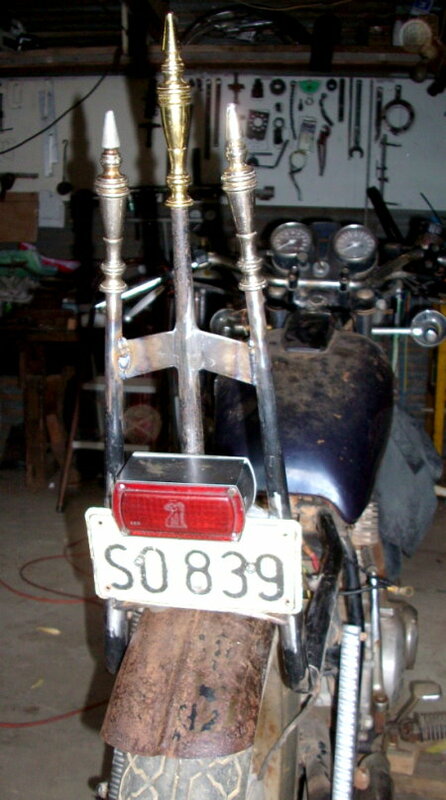 Plate is mounted to sissy bar with a couple of 5/16" UNF countersunk bolts (oops! Will take a pic of counter sinking later). Just wiring to go. Wire will be mostly hidden. I'll add some pics and explanation when I do it.